A Unique Challenge - Part II - Your Turn! Grab for your own 15 minutes of fame! 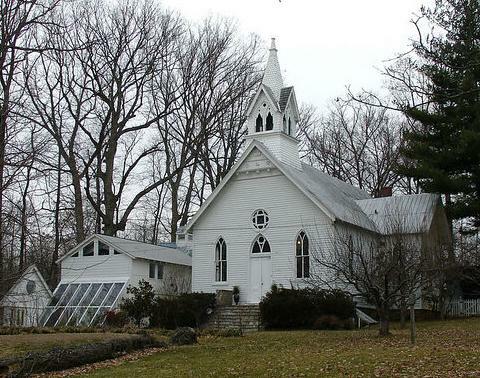 Describe in 100 words or less your most creative - and legal - idea for the use of an historic church building. Tell me what you would do and why it's such a great idea. It could be a church, yes, but it could also be an artist’s gallery as it has been for the last 30 years. What else can you think of? Go to homerome.com for more pictures of this designated historic property, and read more about it in an earlier blog entry. Then send your idea in a comment on this blog or by email, but don't delay - I need your ideas by May 31. The most creative idea will be featured – along with your name and photo, if you like - in my blog and also in one of my newspaper ads in early June. Plus, I'll announce the winner on the radio, and let you know when to listen for it, too. So have some fun, and grab your time in the spotlight. Start thinking outside the box - or church - and enter today! It was one of those times when everything just comes together. This past Sunday I was a guest on the radio show, All About Real Estate, at noon on Baltimore’s WCBM, 680am. Dave Meurer of National City Mortgage and I spent a great hour on the air. The show is always fun because you never know who will call in or what you’ll talk about. I’ve been a frequent guest and sometimes even host of All About Real Estate. It’s good advertising for my sellers because I mention some specific properties plus my website where you find all the listings. Buyers also like the show because they can call in to tell what they are looking for and ask any of the questions they have about buying a home. Sometimes, as happened Sunday, the show is so full of energy that I wish I had recorded it. On this day my fellow CyberStar, Linda DeVlieg from Albuquerque, listened to the show on line and then called in. One of my clients is moving to New Mexico, so of course we discussed what her new life will be like. We also talked about the CyberStars and my Buyers4YourHome page and blogging and my tablet PC - the hour flew by! It was a gorgeous day outside and a great day in the studio.